The Odes of Solomon is a collection of hymns written around the time of the Gospel of John. It is the earliest text to mention Christ’s Descent into Hell. The Odes of Solomon is a collection of hymns believed to have been written in Syriac-Aramaic around the time of the Gospel of John (sometime before 125 CE), given its parallels with the Johannine tradition. The text is considered to be Jewish-Christian in origin, though it has previously been attributed to the Gnostic tradition. Recent studies have linked the Odes to the secessionists mentioned in 1 John, thus associating the author of the text with an offshoot branch of Johannine Christianity around the beginning of the second century. If this date is accurate, it would make the Odes the earliest text to specifically mention the Descent. The two themes of the descent into Hell – the death of Christ and the deliverance of the dead – are now seen in succession in this hymn, whereas in the New Testament references to the descent, the focus was primarily on Christ’s resurrection and the deliverance of the dead. The emphasis on the deliverance of the dead is different from that presented in the New Testament. 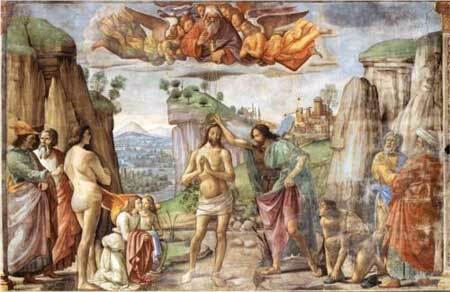 In the Odes, those liberated are no longer the patriarchs of the Old Testament but those who have been baptized. The sacramental imitation of the descent and ascent of Christ is directly associated with the descent into and ascent from water in Baptism. It’s possible that the seven-headed dragon is a reference to Satan, who is not necessarily lord of Hades. However, there is also a reference to the beasts of Rev. 10:3 and 13:1, and also to the ‘dragon in the waters’ of Ps. 74:13. If the dragon is viewed as an allusion to Satan, then Christ’s battle with Satan now has the objective of his own deliverance from the underworld. One last passage that pertains to the Descent is Ode 42, in which Christ descends into Sheol, achieves victory over death, and ascends with those he delivered from Sheol. 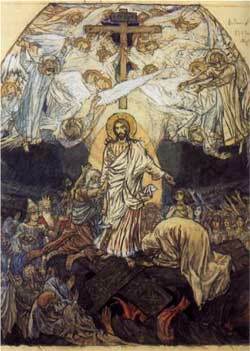 Here, we see Christ preaching to those in the underworld in relation to the theme of conflict with Death. This is the first occurrence of the dead appealing to Christ, which would later become a common theme among Descent literature. Another significant characteristic is that in contrast to the Ascension of Isaiah, Christ journeys to the deepest part of Sheol. Finally, scholars are divided as to whether Satan is equated with Death, though there is agreement that Death is personified. There are some scholars who disagree with this interpretation of a Descent into the Underworld. 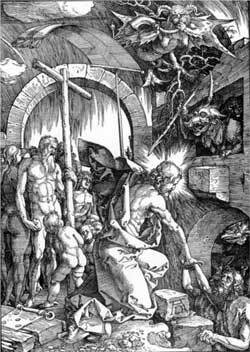 It could be that the Descent in the Odes refers not to an actual Decent into the Underworld, but as a symbolic interpretation of the Incarnate Christ descending to earth, which is identified as Sheol. The Odes of Solomon, builds upon the association of baptism and the descent set forth in the New Testament. This tradition becomes more developed in that the descent into and ascent from baptismal water becomes symbolic with Christ’s Descent into Hades to free the souls imprisoned there. In the Odes, the tradition is not simply Christ’s preaching to the spirits of Noah’s time, but to all who are in the Underworld. However, there is also a possible reference to the spirits of Noah’s time in the Baptismal hymn of Odes 24, thus creating a striking parallel to 1 Pet 3:18-22. The Odes make other advances over the possible Descent myths of the NT in their presentation of the cosmic dualism between Christ and the personification of Death (which may or may not be equivalent to Satan), which must be defeated in order for Christ to Ascend. There is also an allusion to Christ taking Hades by storm in references to Ps 106(107):16 and Is 45:2 which refer to a shattering of the gates and a breaking of the bars.